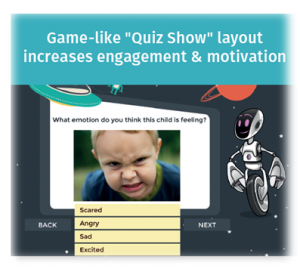 Assessments often frustrate children, especially those with learning challenges, which can result in reduced engagement and motivation, and corresponding poor data quality. Online assessments offer significant advantages over traditional data collection methods, such as higher response rates, higher quality data, and substantial administrative cost savings. 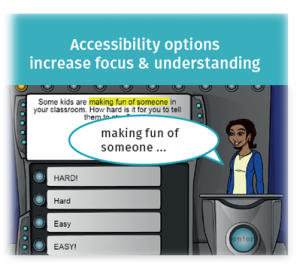 However, current online assessment options fail to offer developmentally appropriate tools specifically designed for children, including accommodations for children with learning challenges. 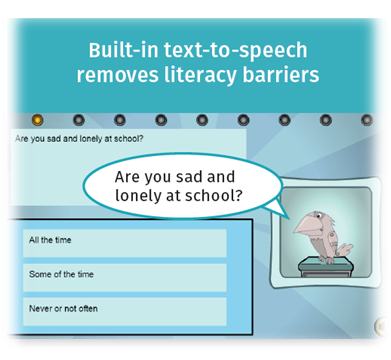 With input from researchers, educators, and other stakeholders, we’ve developed Quest (Assess 2 Progress in Phase I), an online system to deploy developmentally appropriate online assessments for children (ages 6-12 years), incorporating Universal Design principles and featuring accommodation options such as text-to-speech functionality to minimize the effect of learning challenges on data quality. 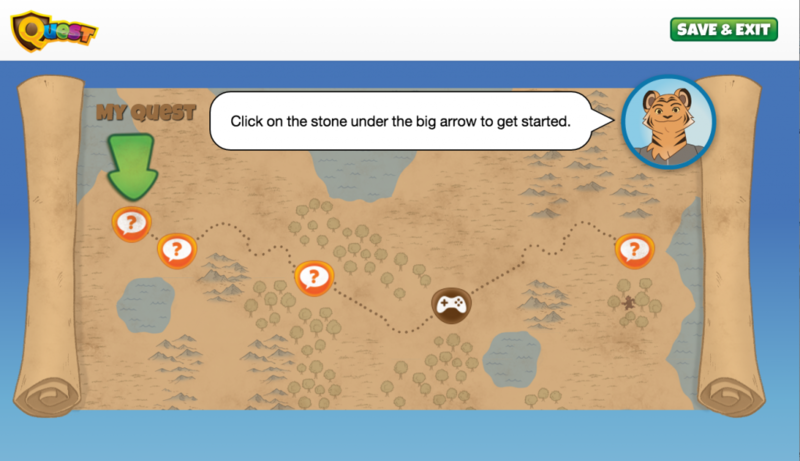 The assessment interface for children is an engaging, game-like environment with built-in accessibility tools. In the management portal, educators and researchers are able to manage assessments, view completion status and descriptive statistics, generate assessment reports, and download data for further analysis. The Phase I research demonstrated usability with children as well as feasibility for key stakeholders. Phase II testing is currently underway to demonstrate efficacy for high quality data collection with children. Read about the research and development of Quest. 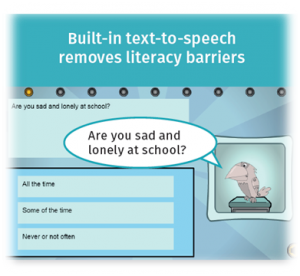 Built-in accessibility tools (e.g., text-to-speech, synchronized highlighting) address learning challenges and maximize children’s engagement and motivation in the data collection process. A game-like environment with a selection of engaging, developmentally appropriate user interfaces and selectable avatars engages children in the assessment. HIPAA-, FERPA-, and COPPA-compliant system allows users to review, manage, download, and print individual and group reports on assessment outcomes. Resource and help centers to aid implementation, including videos, Q&As, FAQs, a database of Universal Design assessment principles, user guide, and video tutorials. The Center for School Mental Health at the University of Maryland School of Medicine has partnered with 3C Institute to develop a web-based portal that helps schools and districts assess and improve their comprehensive school mental health systems. With funding from the Substance Abuse and Mental Health Services Administration (SAMHSA), RAND partnered with 3C Institute to develop Life Improvement for Teens (LIFT), an online intervention to build stress-management skills for adolescents who have experienced trauma.